GSTR-5A is a return form to be filed by non-resident Online Information and Database Access or Retrieval (OIDAR) services provider for the services provided from a place outside India to a person in India to unregistered person or non-taxable customers. It has to be filed by 20th of the month succeeding the tax period to which the return relates to or by the date as may be extended by Commissioner. If the return for the previous tax period has not been filed, GSTR-5A for a particular tax period can be filed only after making full payment of taxes and other liabilities. Select the Financial Year & Return Filing Period (Month) for which you want to file the return & click ‘SEARCH’. 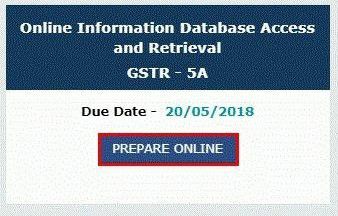 Click the ‘PREPARE ONLINE’ button. Tile-5: Taxable outward supplies made to consumers in India. Click the ADD DETAILS button to add details for a new POS. 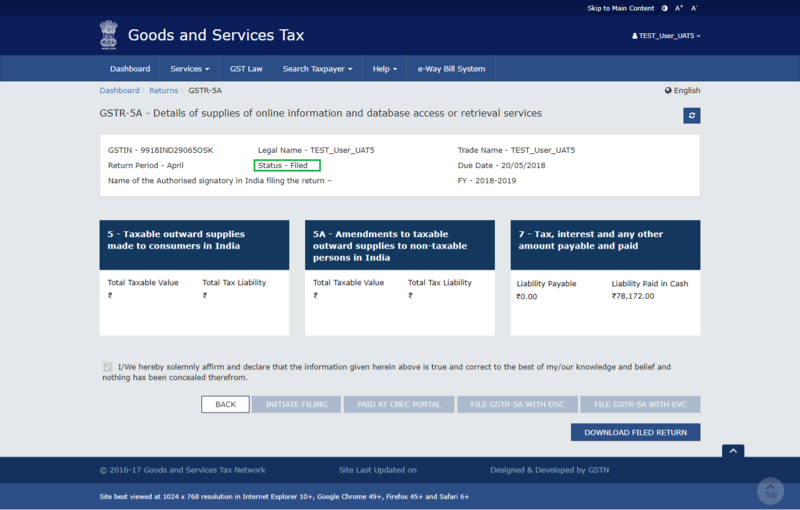 Select the Place of Supply, Enter taxable value, Rate and Tax amount and Click ‘ADD’. The details are added. Note: In case there are two rate supplies in a State, click the ADD DETAILS button again to add details. Click the SAVE button. Similarly, you can add details of State-wise supplies made to consumers during the tax period. Select the Place of supply and the Month and Year of filing, to get the list of entries made during this period. To Add missed entries, Click ‘ADD DETAILS’. 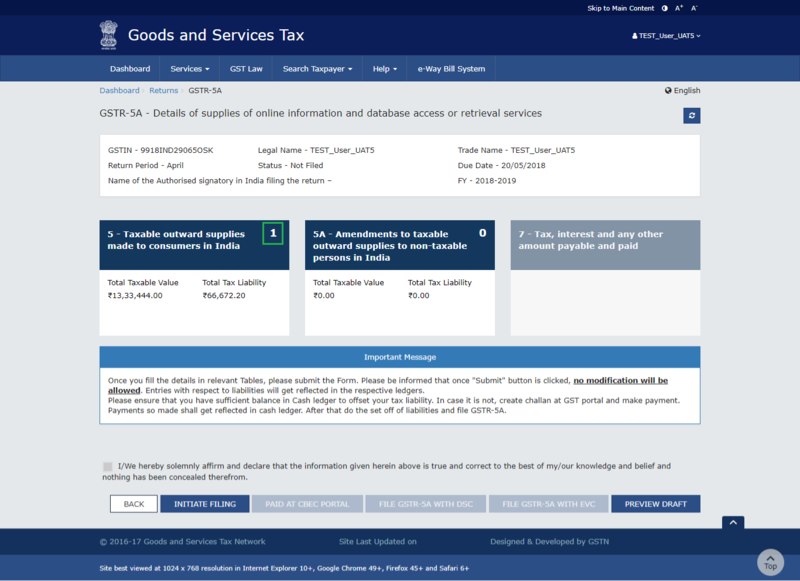 Then, enter the revised Taxable value or the correct rate or correct Tax amounts and click ‘ADD’. Note that Place of supply cannot be revised. The amended records are displayed. You can also click the Delete button to delete the record. Click the SAVE button. To amend the details already entered, Click the Edit button to edit the details. After editing the details, click the SAVE button. Click the BACK Button. You will be directed to the GSTR-5A landing page and the 5A – Amendments to taxable outward supplies to non-taxable persons in India tile in GSTR-5A will reflect Total Taxable Value and Total Tax Liability. Click the PREVIEW DRAFT button to preview the PDF draft for GSTR-5A. Draft is displayed in PDF format. The INITIATE FILING button will freeze the information filled up for that particular month. Please ensure that Electronic Cash Ledger should have sufficient balance to offset your tax liability. In case it is not, create challan at GST portal and make payment which will be reflected in Electronic Cash Ledger. Thereafter, proceed on to set off liabilities and file GSTR-5A. Summary of information is displayed. Click the CONFIRM AND SUBMIT button. Please note that clicking on the CONFIRM AND SUBMIT button will freeze the information filled up for that particular month. Refresh the page and the status of GSTR-5A changes to Submitted after the submission of GSTR-5A. To view details of interest or any other amount payable, click the tile 7 . Click the CHECK LEDGER BALANCE button to know the balance in the Electronic Cash Ledger. Click the OFFSET LIABILITY button after filling in the amount to be paid in various heads. Liability is offset and debit number is displayed. Click the BACK button. 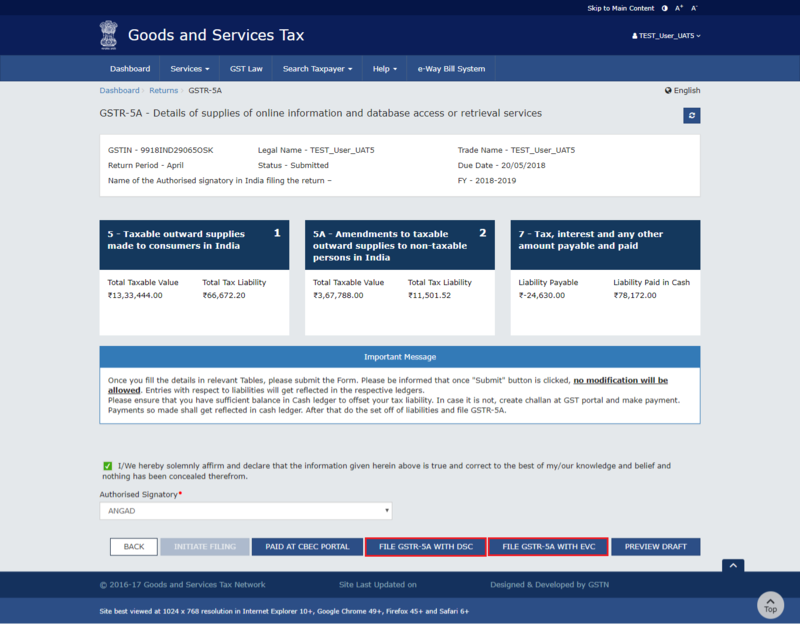 Click the PREVIEW DRAFT button to preview the draft for GSTR-5A. The form is displayed in the PDF format. In case you have already paid the liability of GSTR-5A through CBEC Portal, you do not need to go for net banking for paying the liability through cash. Click the PAID AT CBEC PORTAL button. Enter the Reference number and Date of the payment as generated in the CBEC Portal. Payment Reference number should be either numeric or alphanumeric and should be upto 25 digits. Once the details are submitted, credit entry is posted to the Electronic Liability Register and taxpayer can file the return. After filing return, tax authorities of CBEC may verify the payment made. You can click the PREVIEW DRAFT button to preview the draft for GSTR-5A. Tick the box against the Declaration. In the Authorised Signatory drop-down list, select the authorized signatory. This will enable the two buttons – FILE GSTR-5A WITH DSC or FILE GSTR-5A WITH EVC. 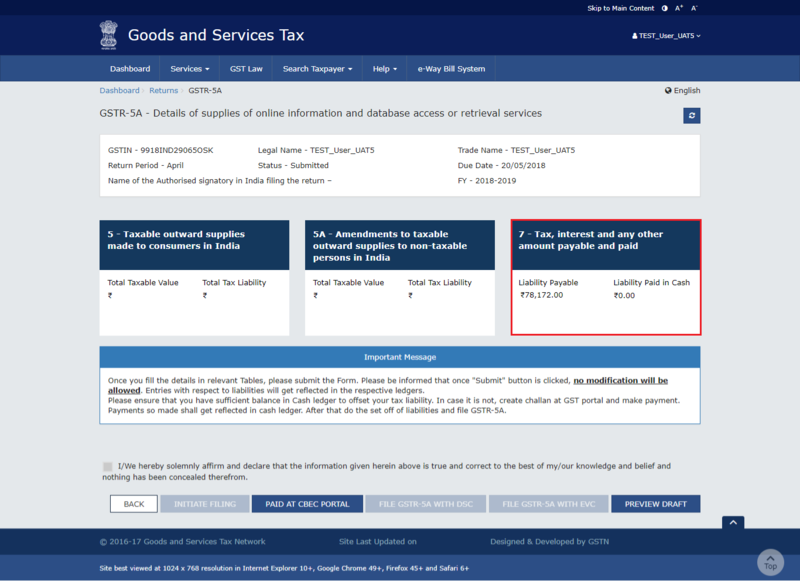 Click the FILE GSTR-5A WITH DSC or FILE GSTR-5A WITH EVC button to file GSTR-5A. The success message is displayed. Click the CLOSE button. The status of GSTR-5A changes to Filed. Note: Authentication with DSC can be done if the authorised signatory has a DSC which is issued on an Indian PAN. On filing of the GSTR-5A, an acknowledgement through e-mail message and SMS is sent to the Authorized Signatory’s mobile. Click the DOWNLOAD FILED RETURN button to download the PDF of the field return.